It's hard to talk about Resogun as a "launch title" and not mention Geometry Wars: Retro Evolved on the Xbox 360. For many that was the killer app for Microsoft's console for quite some time. 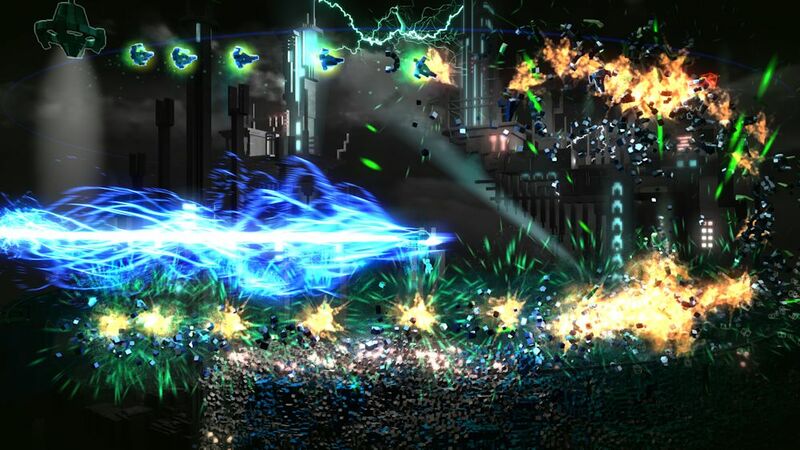 Resogun might be in the same boat for the PlayStation 4. 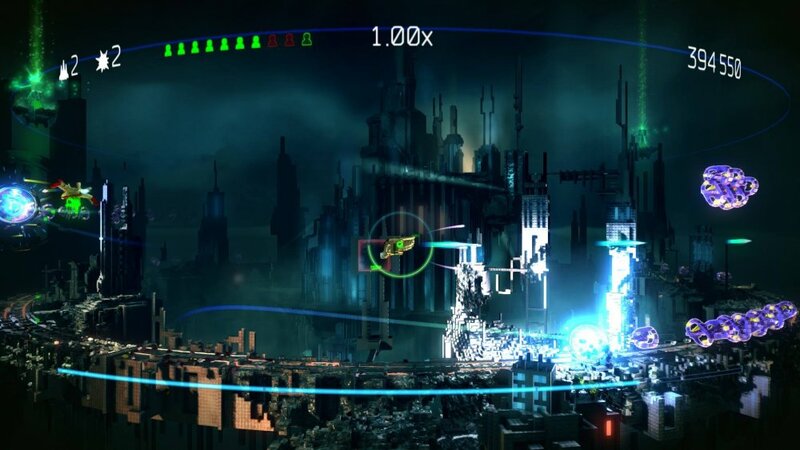 Resogun is created by Housemarque, developers of Super Stardust HD, Outland and Dead Nation. All solid titles, all featuring co-op play in some form or another. Resogun is most similar to Super Stardust HD in that it's a shoot em up arcade game where the goal is to complete levels and gain high scores. While SS:HD took place on a spherical world, Resogun's levels are cylindrical in nature. Players can choose from three ships each with their own strengths built around three categories: agility, boost and overdrive. While agility governs the speed of the ship, boost is a special move that allows you to quickly move around the level while also being immune to damage. Overdrive is a special attack that deals massive damage (see how I worked a PlayStation 3 launch joke in there?) to enemies and also helps create large scoring chains. The goal of each level is to rescue 10 tiny humans trapped in little square jars. They are released by killing enemies called "keepers. "Once freed from their prison players need to pick them up and take them to ships waiting to travel off planet. It sounds simple but the chaos quickly unfolds and it's easy to lose the little guys in the action. Thankfully there are on screen visual and audio clues to help you in your quest to save the last humans. Each of the games' five levels culminate with a boss battle. They aren't overly difficult and the patterns are fairly obvious, but they do add some tension. The levels offer some minor variety in terms of visuals, including lakes, fire, and plenty of stuff that explodes. 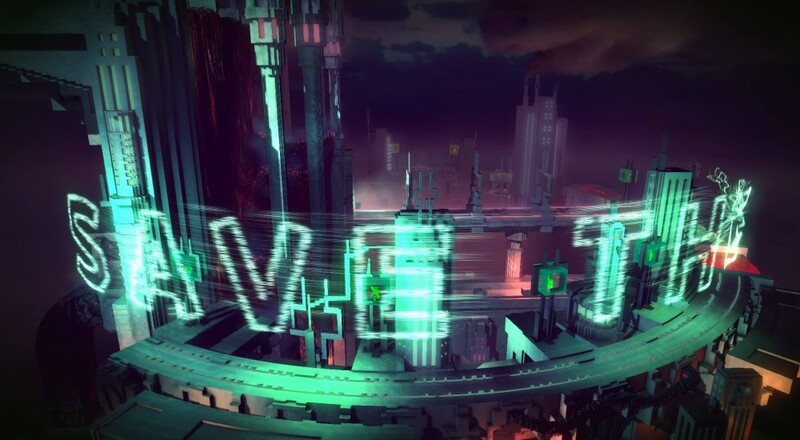 Resogun is built using voxels instead of typical polygons. So as stuff explodes in the game a shower of particles litter the screen. If you've ever seen physics demos on computers a few years back, it's pretty similar, though much more impressive. Co-Op in Resogun is an online affair as of now, with you and another player playing through the same levels as the single player game. There seems to be some minor scaling going on, but for the most part, the gameplay is identical. Picking different ship classes help differentiate players on the screen, but in the chaos, it would have been nice to have player ships be different colors to help tell them apart. Sadly the classes don't really feel like they play off of each other much, so you really just choose the ship with which you're the most comfortable. We hit a few issues with lag as the game seems to want a really solid connection while playing, but when Resogun worked in co-op it was a ton of fun. In co-op, players have their own pool of lives, their own multiplier and even their own score - though they do share the bombs at your disposal. What co-op boils down to is fast and frantic action with communication on who should be trying to rescue the human while the other player covers them. It's also incredibly fun (and hilarious) to hit the L2 button and toss the human in the air to the other player like passing a ragdoll football. Resogun is one of those games that appear simple on the surface and it's something anyone can enjoy. It's not overly frustrating or difficult, though there are four difficulties available for replayability. Once you truly start to understand the scoring mechanic, and see the leaderboards, that's when you realize there's a lot here to master. Resogun is beautiful, chaotic, and just plain arcade fun. Sometimes, we just need to be reminded that's why we buy these consoles. The Co-Op Experience: Two players team up to complete levels for high scores. Three different ships are available. Page created in 0.7956 seconds.